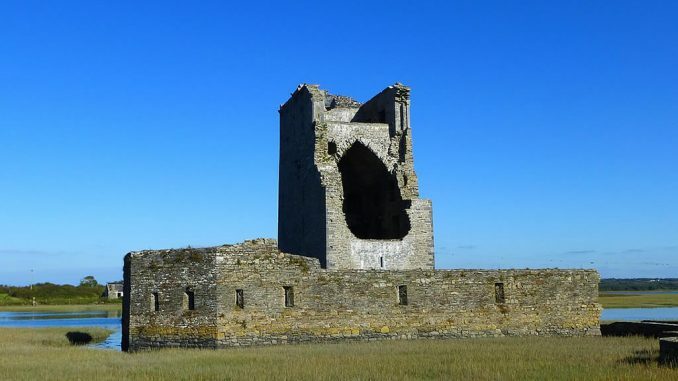 Carrigafoyle Castle near the village of Ballylongford which was built by Conor Liath O’Connor-Kerry in the 1490s was a large tower house which was fairly common in Munster at that time. During the Desmond rebellion in about 1580 the castle was defended by 50 Irish and 16 Spanish soldiers. The castle was bombarded by the forces of Sir William Pelham and the ships’ cannons of of Sir William Winter over two days, six hours each day. In the final assault, the tower cracked under the impact of the bombardment and the west wall collapsed crushing many of the defenders. The damage to Carrigafoyle Castle was so severe that it was never repaired although it was occupied for many centuries afterwards. Most of the occupants were massacred although some may have escaped. Its ruins still stand, including the outer defences and moat, and the effect of the bombardment is clear to see. Built on the edge of the Shannon estuary on what was originally an island, Carrigafoyle Castle rises 26.4 meters over five stories and has a spiral stairs in one corner with rooms and the main living spaces opening off it. Carrigafoyle Castle was the main stronghold of the O’Connor Kerry clan, after whom the Itaghticonnor barony was named. They were in possession of Carrigafoyle for long periods over 400 years. The castle was known as ‘the impregnable castle’ because of it held out for so long against Cromwell’s attacks. It was one of the last castles to have been conquered by the Cromwellians who hanged the occupants. The castle is a national monument and is managed by The Office of Public Works. The OPW has been engaged in the preservation of the castle for many years and they have partially restored some of the walls and the top floor. It is possible for visitors to climb the circular stone staircase to the top and take in the panoramic view. 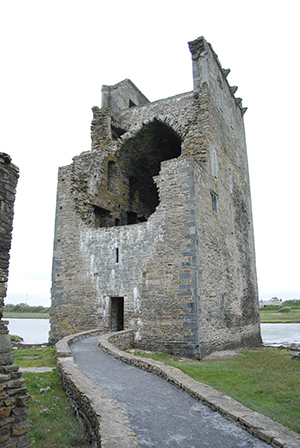 Access to the castle is along a raised path which is sometimes submerged at high tide. It is open to the public from June to September from 10 a.m. to 6 p.m. Here is a revealing video by PixieFilms of Ballylongford Choir singing ‘Ode to Joy’ at the top of Carrigafoyle. Ballylongford Choir at Carrigafoyle Castle singing "Ode to Joy" by Beethoven.Carrigafoyle Castle – built by Conor Liath O'Connor-Kerry in the 1490s and considered one of the strongest of Irish fortresses – was a large tower house, of the type particularly common across the north of the province of Munster. It stood on a rock in a small bay off the Shannon estuary, and its name is an anglicisation of the Irish, Carraig an Phoill ("rock of the hole").The castle was known as The guardian of the Shannon because of its strategic command of the shipping lanes that supplied the trading city of Limerick, some 20 miles (32 km) upriver. The bay at Carrigafoyle was shielded from the estuary on the northern side by a wooded island; within the bay the castle-rock was defended on the west and south sides by a double defensive wall; the inner wall enclosed a bawn, and surrounding this was a moat covered on three sides (the east lay open) by the outer wall, where a smaller tower stood. The tower-keep itself was 86 ft high, and the precipitous sides of the castle-rock were layered with bricks and mortar. At high tide the walled landing within the moat was capable of accommodating a ship of 100 tons displacement.SiegeDuring the rebellion the castle was held by 50 Irish, along with 16 Spanish soldiers who had landed at Smerwick harbour the previous year in the 1579 Papal invasion; there were also women and children present. Months earlier an Italian engineer, Captain Julian, had set about perfecting the castle's defences under the direction of Desmond's countess, Eleanor. By the time of the siege she had retired to her husband's company – some forty miles (64 km) distant, at Castleisland – while Julian was still at his task.The English commander, Sir William Pelham, marched through Munster in the company of Sir George Carew and assumed command of an additional 600 troops. He was supported by a fleet of 3 three-masted ships under the command of Sir William Winter. It was the largest army ever seen in the west of Ireland.On arriving at Carrigafoyle the English camped to the south-west of the castle. The fleet anchored in the estuary beyond the bay and supplied Pelham with 3 demi-cannon and a culverin (a huge naval gun with small projectiles) manned by naval gunners. The ordnance was ranged along a low wall running north, parallel to the outer wall at a distance of 100 yards, and at the northern point of this wall a company of foot with lances was stationed.The bombardment of the castle was carried out over two days, six hours each day. The demi-cannon could be effective against stone, but only if allowed to fire unhindered – in the event no hindrance was given. In addition Winter's ships fired their stern cannon against the seaward wall of the castle.On the first day (Palm Sunday) Pelham ordered a party of troops to cross to the sea-wall, where they were pinned down by gunfire and had boulders hurled at them from the battlements. The troops threw up assault ladders, which the Spanish halberdiers pushed away. The Earl of Ormond described seeing the sea-channel fill with wreckage as the sides of the castle-rock became slippery with blood. Pelham was hit by a ricochet and jeered at by the defenders, but there was no pause in the bombardment.On the second day, Pelham was reinforced with troops from Winter's ships. The final assault, led by Captains Humfrey Mackworth and John Zouche, was concentrated on the part of the tower furthest from the cannon, where the defenders were holding out. The tower cracked under the impact of 2 or 3 shot, and the great west wall collapsed on its foundations, crushing many within. The survivors fled through the shallow waters, but most were shot or put to the sword; the rest (including one woman) were brought back to camp and hanged from trees. Captain Julian was hanged three days later.